BDO World Darts Championship 2018: Tips honed for title battle. It’s that time of year again. World’s Strongest Man has just finished and the coming of the New Year brings with it another of the highlights of the traditional festive sporting calendar, the BDO World Darts Championship. From the 6th January, the Lakeside in Frimley Green once more hosts the world’s top dart players, all hoping to be on that famous stage the following Sunday evening to have a chance of taking the title. 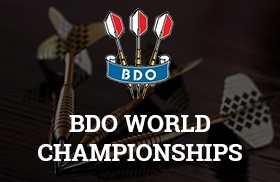 Now in its 41st year, the BDO World Championship has been hosted by the Lakeside Country Club in Surrey since the mid-eighties and the Frimley Green venue is well known the home of World Darts. Unlike its near silent cousin snooker, the atmosphere created by the enthusiastic crowd at the Lakeside is as much a part of darts as the players themselves. Fancy Dress is encouraged for spectators and this, combined with a large helping of cold drinks, helps create the loud and lively conditions that players compete in. Over the years many famous names have emerged from this raucous sporting arena. King of the 80’s was Eric Bristow, 3 titles in a row and 5 in total saw Bristow become a household name throughout the UK. Darting superstar Phil “The Power” Taylor also triumphed at the Lakeside in 1990 and 1992, wins that helped make him the man to beat for the next quarter of a century. Following the departure of Bristow and Taylor to the newly formed Professional Darts Corporation, the dominant force of the late 90’s and early 2000’s became Raymond van Barneveld. Collecting an impressive haul of 4 BDO World Championships between 1998 and 2005, the Dutchman went on to become a firm favourite at the Lakeside. The new millennium saw 2 Lakeside titles for Ted “The Count” Hankey and a further 3 for Martin “Wolfie” Adams. In 2006 Adams was involved in what is surely one of the most extraordinary finals of any sport. On paper it didn’t seem like much, two 50-year-old men contesting the final on a dark and cold Sunday night in January and yet it went on to become one of the most nerve-wracking and unpredictable matches ever. The first man to reach 7 sets was to be champion and when Adams took the first six to lead 6-0, it appeared to be just a formality for him to take the title. His opponent, Phil Nixon, had other ideas. Suddenly coming to life and roared on by the crowd, Nixon took the seventh set to make it 6-1. With Nixon gaining in confidence while Adams lost his way, it was suddenly 6-6 and the match was into a deciding set. Having just lost 6 sets in succession, Adams somehow regained his composure to land the double top that secured the title. This year sees Martin Adams return to the Lakeside for a 25th year, joining him on the stage is number 1 seed and reigning champion, Glen Durrant. Other former champions chasing the £100,000 prize include Scott Mitchell and 2-time winner Scott Waites. If the draw follows the seeding, a potential second-round clash between Durrant and last year’s semi-finalist, the in-form Darryl Fitton, looks to have the makings of a classic contest. Over in the women’s draw, number 1 seed Deta Hedman is looking to improve on her disappointing first round exit last year. Standing in her way of the £12000 prize is Russia’s Anastasia Dobromyslova, with a hat-trick of titles she has always got to be considered a contender at the Lakeside. The women’s draw would not be complete without 10-time champion Trina Gulliver. As one of the greatest female players ever, her seeding of 7th this year shouldn’t put you off backing her to go all the way to the final. With players from as far afield as Turkey and Brunei, this year’s contest is broadcast on Channel 4 and also BT Sport from Saturday 6th-Sunday 14th January. On top of Match Betting, BetVictor pre-event darts betting markets include Set Betting, Most 180s, Total Number of 180s, Player To Score Highest Checkout, and even whether there will be a Nine Dart Finish. Bet with the best odds on Darts with the Betfair™ Exchange. The Best Online Betting Exchange For Darts where you can Bet In-Play, Cash Out and access other Darts Betting Offers. Experience the Best in Darts Betting at Betway Sports who bring you competitive darts odds, and dozens of markets for each match. Markets include match Winner Correct Score, Handicap Markets and Match Specials.